Adam Hinshelwood felt he had a poor performance in the dugout on Saturday as Worthing drew 1-1 at home to Leatherhead. Callum Kealy's late strike rescued a point for ten-man Worthing, who had Will Miles sent off for two bookings, in the Bostik League Premier Division clash. Worthing dropped a place to third in the table and are now four points behind leaders Tonbridge Angels, who lost 3-2 at home to Bishop's Stortford. Travis Gregory gave Leatherhead the lead on 35 minutes when he knocked home the rebound after Lucas Covolan saved Elliot Benyon's penalty. Miles saw red for a second booking five minutes from time but Kealy's volley made it 1-1 three minutes later. Leatherhead also finished the game with ten men after Thomas Cooney was dismissed for a second booking. Reflecting on the game, Hinshelwood said: "It was probably a fair result, if anything we snatched a point in the end. "I thought my own performance was a poor one. The impact of the changes I made in terms of trying to change the shape didn't really transpire how I wanted it to. "We started with our normal formation and I tried to be progressive and tried to change it for the better to have a positive effect with more attacking intent in mind. "But it didn't really transpire that way if I'm being perfectly honest. Maybe in hindsight, we should have kept believing in what we were doing because we were starting to create opportunities but I wanted to try to change it and be a bit more attacking minded. "But we're a real young side and are learning all the time. 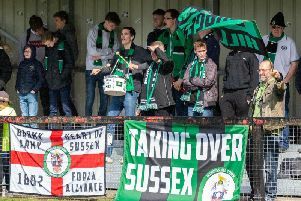 "We were nowhere near at our level best but Leatherhead were really organised, had a good shape and made it difficult for us. "They're better than what the league table suggests and they had some real threats in their team." Hinshelwood added the draw might be a point Worthing look back on as a good result: "Potentially, particularly after going down to ten men again. "We scored when we were down to ten and they had 11, so there's good character within the group to keep fighting but I still think there's more to come from us." Hinshelwood feels Miles will learn from his red card and said: "Will had a long period out and I thought he was excellent last week against Chelmsford. "But he's only 22 and you're always going to get some inconsistency with young players. "However Will is the type of player who will learn from Saturday, come back from it and be better. "That's what we all look to do. We all have the same mentality here and will be working our level best to make sure Wednesday (at Lewes) we up our game."